Located on Maryland’s Eastern Shore, Dorchester County is within a convenient drive from many major cities. 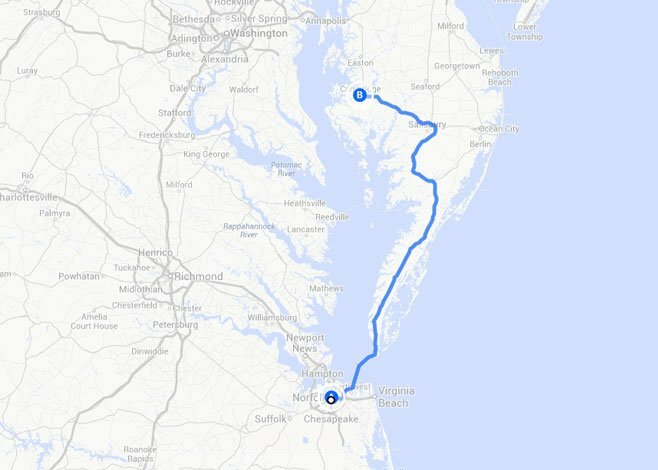 So buckle up and set out for a weekend retreat in the Heart of the Chesapeake! 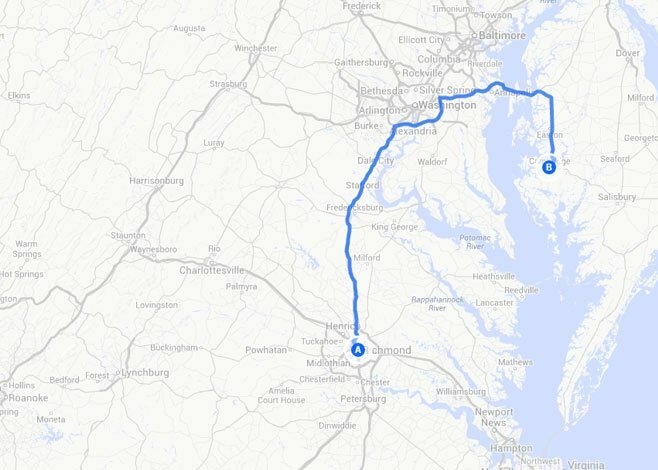 Take US Route 50 East and cross the Chesapeake Bay Bridge. Continue on Route 50 East to Cambridge. I-695 towards Key Bridge/Glen Burnie. 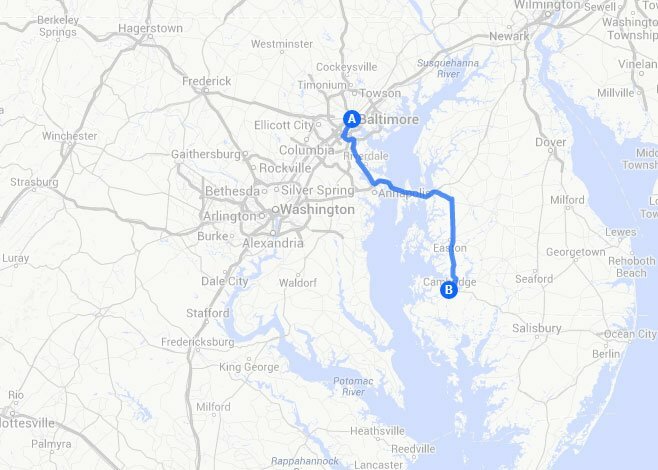 Take Exit 4 onto Route 97 towards Annapolis/Bay Bridge for 18 miles. Take ramp onto US Route 50 (US 301) towards Annapolis/Bay Bridge and cross the Chesapeake Bay Bridge. Continue on Route 50 East to Cambridge. Take New York Ave NW, which turns into US Route 50 East. 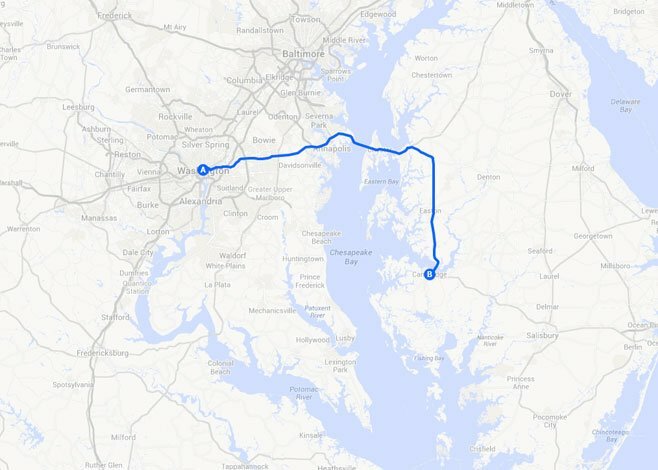 Stay on this route across the Chesapeake Bay Bridge, and continue eastbound to Cambridge. Take US 13 Business South. Continue south on US 301/US 13. Turn right at exit 136 onto ramp towards SR 299/US 13/Odessa/Middletown. Continue until you see signs for US 301 (SR 299). Take ramp to SR 213; turn left. At first traffic light, turn left onto US Route 50 East and continue on this route to Cambridge. Get on I-95 towards International Airport. Turn right at exit 11 towards I-495/Port of Wilmington/Baltimore. At exit 3, stay on I-495. At exit 4A turn right onto ramp towards SR-1/SR-7/Christiana Mall Road. Continue to US 13 towards SR-1/Dover/Seashore points. Continue south on US 301/US 13. Turn right at exit 136 onto ramp towards SR 299/US 13/Odessa/Middletown. Continue until you see signs for US 301 (SR 299). Take ramp to SR 213; turn left. At first traffic light, turn left onto US Route 50 East and continue on this route to Cambridge. Take I-95 towards I-64/I-95/Charottesville/Washington; merge onto I-64 (I-95). Keep right onto I-495 north towards Baltimore. At exit 19A, take ramp to right onto US Route 50 East, towards Annapolis. Continue eastbound across the Chesapeake Bay Bridge and onto Cambridge. 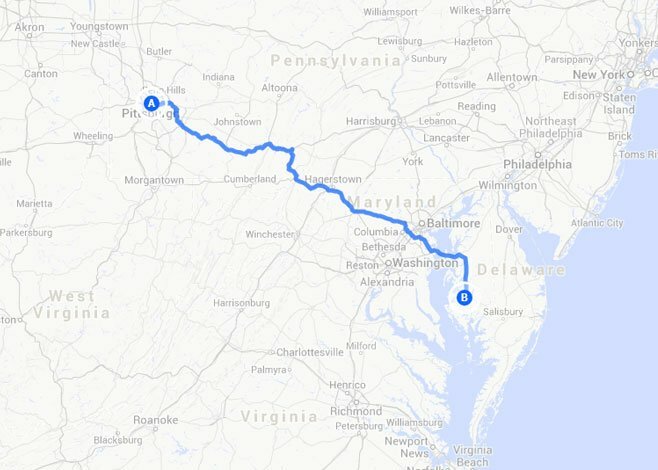 Take I-78 to I-95 South. 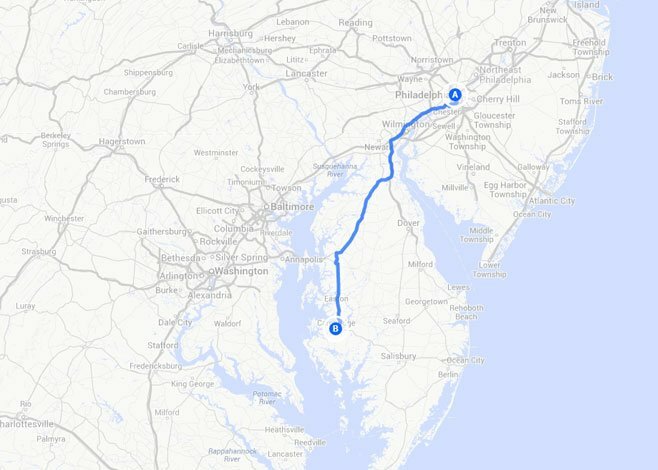 Road name changes to New Jersey Turnpike/US-40/I-295. Continue until turn off for US 13/US 301 toward Baltimore/Dover/Norfolk. Keep right onto N. DuPont Parkway. Merge onto US 301/US 13 south. Road name changes to SR-1; stay on SR-1 south at exit 148. Turn right at exit 136 onto ramp towards SR 299/US 13/Odessa/Middletown. Continue until you see signs for US 301 (SR 299). Take ramp to SR 213; turn left. At first traffic light, turn left onto US Route 50 East and continue on this route to Cambridge. From I-376 (US 30) towards Monroeville, turn right at exit 15 towards I-76 PA Turnpike. Keep right to stay on ramp towards I-76/Harrisburg/exits 7-39. I-76 name changes to I-70, continue to exit 161 onto I-70 Conn. At exit Conn US-30, take ramp onto US-30 (Lincoln Highway). Take left ramp onto I-70. Turn right at exit 91B/91A, towards I-695/I-95/Baltimore/Towson. Take right ramp to onto I-695/Baltimore Outer Loop towards Glen Burnie. 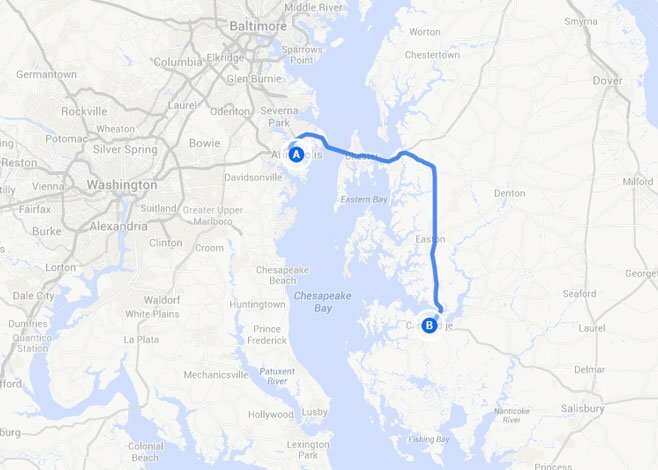 Take Exit 4 onto Route 97 towards Annapolis/Bay Bridge for 18 miles. Take ramp onto US Route 50 (US 301) towards Annapolis/Bay Bridge and cross the Chesapeake Bay Bridge. Continue on Route 50 East to Cambridge. Enter the Chesapeake Bay Bridge Tunnel/US 13 and cross into Maryland. Near the town of Salisbury, turn onto US Route 50 West, towards Cambridge. Enter Cambridge, and turn left at Maryland Avenue, the last light before the Choptank River bridge. Follow into downtown Cambridge. 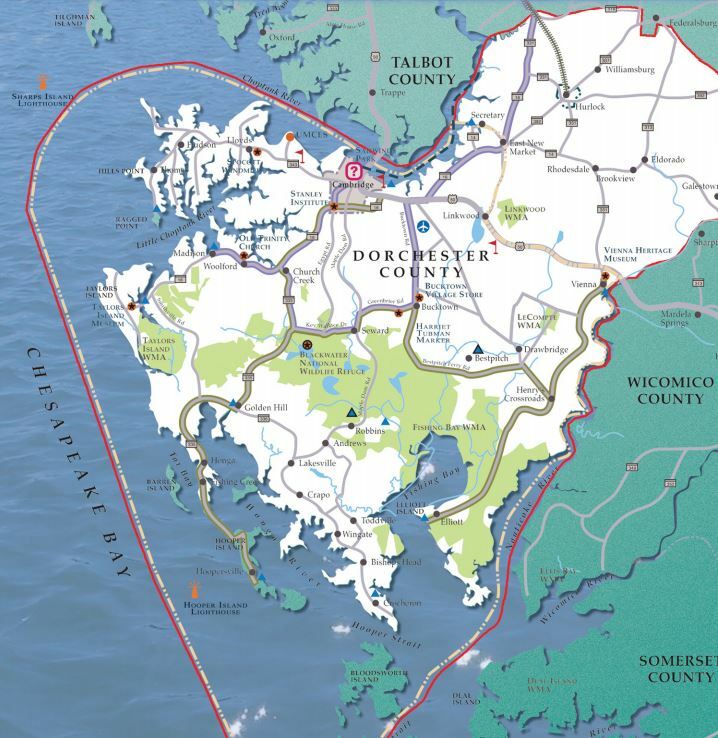 Dorchester County is located in the central part of Maryland’s Eastern Shore. 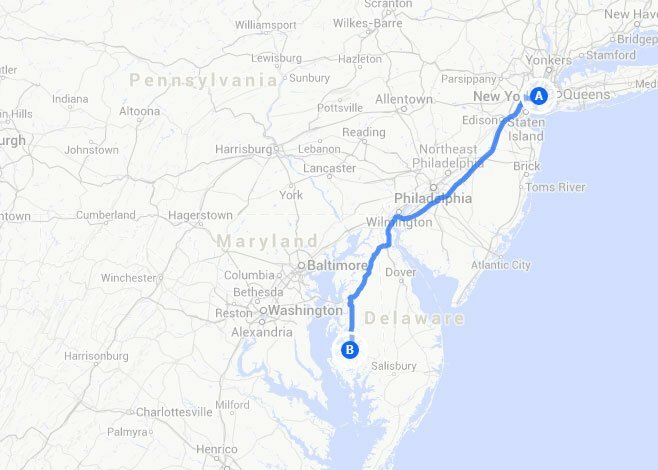 It lies on the west central edge of the Delmarva Peninsula, a body of land comprised of portions of Delaware, Maryland, and Virginia, bordering on the Chesapeake Bay, the Delaware Bay and the Atlantic Ocean. Water is Dorchester’s most impressive physical feature and the County is virtually surrounded by the Chesapeake Bay and rivers. 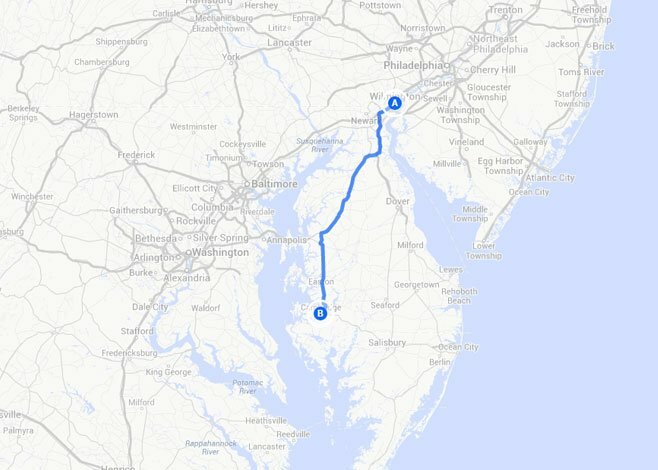 Dorchester is bounded on the west by Talbot County, on the east by Wicomico County, on the north by Caroline County and the State of Delaware and on the south by the Chesapeake Bay. The Chesapeake Bay is a more recent geological development formed approximately 18,000 years ago. At that time the last glaciers began to melt and Dorchester was upland area sloping into the Susquehanna River Gorge. The Choptank was a river falling rather quickly into the Susquehanna. As the glaciers retreated by melting, the sea level rose by approximately 400 feet, forming the Chesapeake Bay.